So when the OH came home armed with over a kilo of strawberries, I set about coating them in layers of Nutella. I say I, but in all honesty, it was my trusty little kitchen helper who set about smothering the strawberries with Nutella. He absolutely insisted on putting on my apron too. Wash the strawberries and hull them so that they have a base to sit on. Spoon out a couple of heaped spoonfuls of Nutella into a microwaveable bowl. Warm the Nutella in the microwave for 20-30 seconds to make it go runny. Stir half way through. 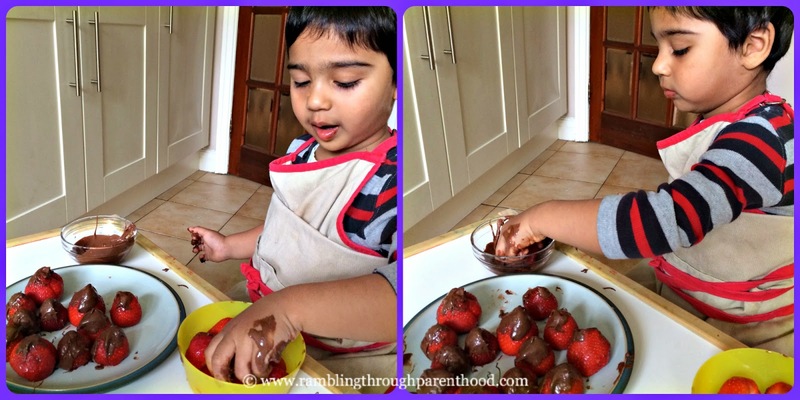 Place the strawberries and the warm (not hot) Nutella in separate containers on your toddler's work table. Your work now is done. Demonstrate if you must. Supervise if you really have to. Or else, step back and watch as your tot goes about this business of coating strawberries with single-minded focus and abundant determination. 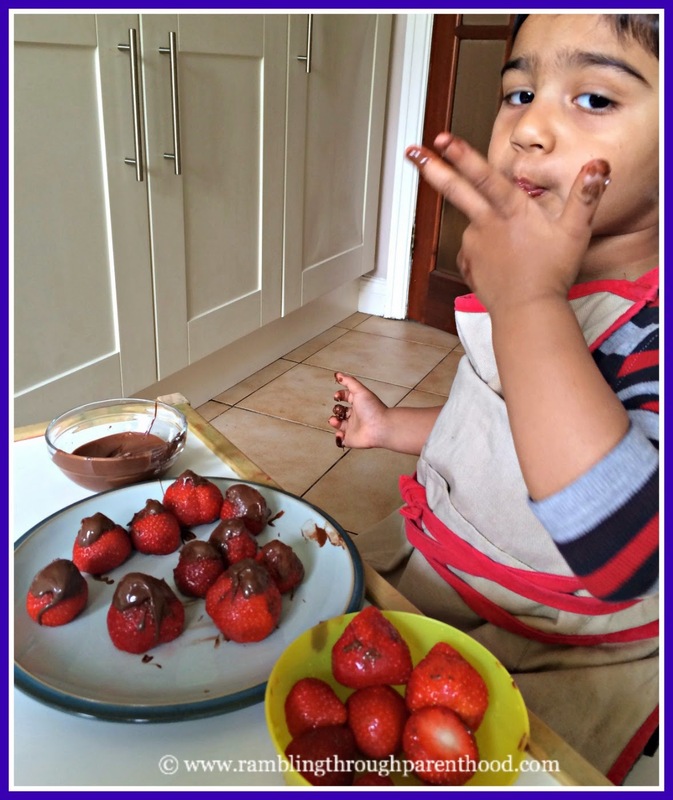 Watch as he picks up each berry with dexterity, swirls it in the gooey gloop that is the Nutella. Admire as he places each berry, smothered in chocolate, on the plate in front of him. And chuckle as he licks his Nutella-covered fingers. You know you would too. Once all the berries are coated and the left-over Nutella has been licked clean, place the coated strawberries in the fridge for at least half an hour. A bit longer if you can resist the temptation to devour them right away. It just helps the Nutella to set. You can eat these Nutella coated strawberries at home, serve them at a garden party, or pack them up for a lovely picnic. Just make sure they stay cold before serving or you will end up with a mess of chocolate on your plate. And they really do taste better cold. A word of caution. You have to be quick when coating your strawberries, as the Nutella tends to solidify quite quickly. Do not try to reheat any partly used Nutella. Any water in it (there will be water if you are using washed strawberries), and the Nutella goes all flakey. For best results, use small amounts at a time. Heat, use, eat. Then heat a fresh batch to coat some more strawberries. They look so delicious and my son would love them! Thanks for sharing your tips! Yummy! What a great idea! Bet they were delicious. Yummy!!! Plain chic spread would be better for me as I am not a fan of Nutella! My kids however would adore these!! mmm...Nutella is awesome! Never thought to coat strawberries with it though! My boyfriend and son would love these! Yum! Not sure about this as I love fruit plain but my kids certainly like doing this! Delicious! 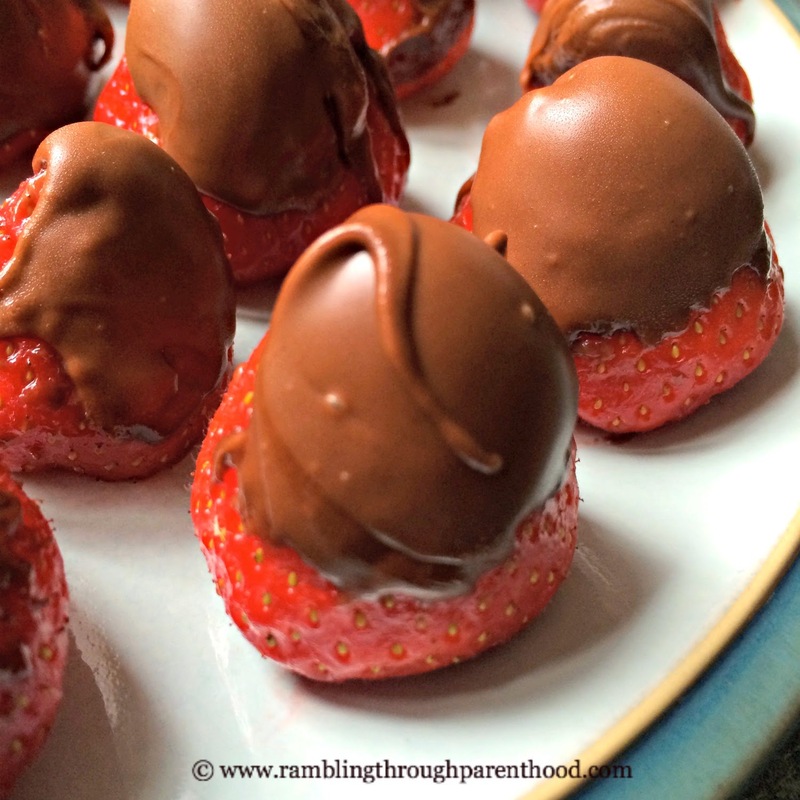 I have never actually tries choc covered strawberries but I just know I would love them! Oh my goodness, these are two of my sisters favourite things EVER! She'd love this! I like each on their own, not sure I could combine the two! 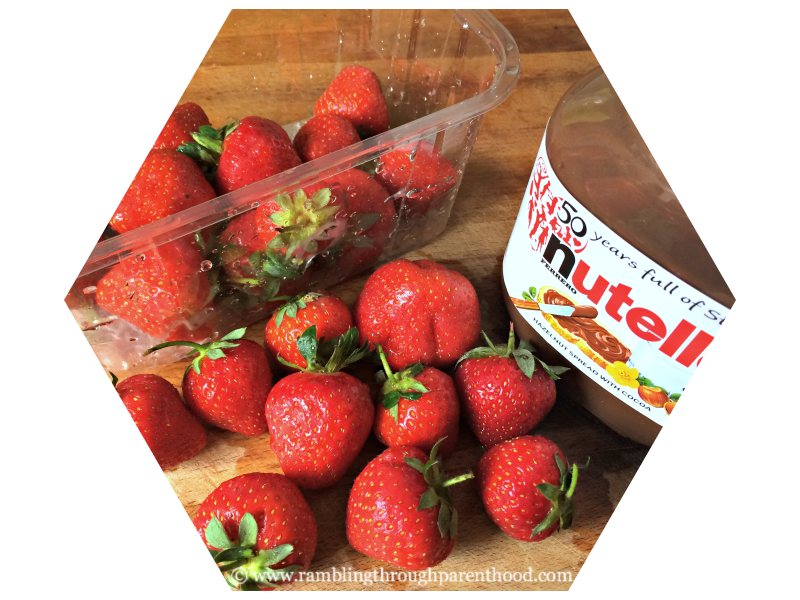 Love strawberries, love nutella....have to do this soon! Oh yummy - instant fondue! I love messy food at times. It's perfect for uniting friends and family in the quest to keep a clean shirt.